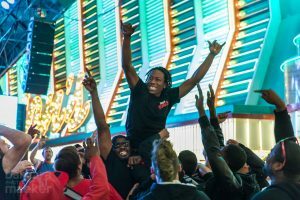 For the first time in his career, Kendric Washington has taken the title World Sign Spinning Champion at this year’s competition. 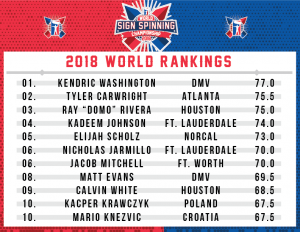 In a finals that featured not only former World Sign Spinning Champion Kadeem Johnson(Fort Lauderdale) and Ray Rivera(Houston) but it also included 2017 finalists Elijah Scholz(Nor Cal), Nicholas Jaramillo (Fort Lauderdale) and Kacper Krawczyk (Poland). With his sponsored Campus Coin sign, Kendric displayed an amazing blend of athleticism, execution and technical skill, to edge out Tyler Cartwright(ATL)in a first-place tiebreaker. Kendric worked hard preparing his choreographed routine for the event and was looking forward to everyone coming together this year in Las Vegas. Click Here to Watch the 2018 World Sign Spinning Championship Highlights. Washington plans to use his first place earnings toward his own professional development so he can make himself and AArrow better. He says his best experience working as a sign spinner was traveling to Las Vegas, interacting with AArrow employees from across the globe and winning the 2018 competition. Congratulations to Kendric Washington as he brings home the first Sign Spinning Championship to the AArrow DMV team!